Why do 95% of diets fail? Why is it that most people who start an exercise program quit within 6 months? Why is it just so hard to live healthy? If you have ever struggled with eating healthy or getting enough exercise this article is just for you. Dogs really can teach us a lot about how to maintain a healthy lifestyle. 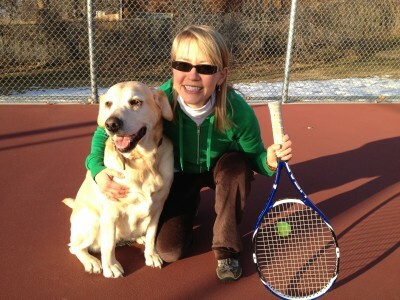 In March of 2010, after years of intense lobbying by our children, we finally gave in and decided to adopt a family dog. Our selection criteria were really quite simple. We wanted a mature dog that was already house trained, one that did not bark much, and one without separation anxiety. These criteria were all based on our previous dog which caused us much grief. With these criteria in mind, we packed the entire family in the car and drove off to our local Humane Society to adopt a new family dog. As soon as we entered, all of the dogs were barking intensely but one. The only dog not barking was an old and depressed appearing yellow lab lying in a corner kennel. “Why hasn’t she been adopted yet,” I asked. “Our needs are different,” I replied. As Andi was the only dog that was not barking, we asked if we could take Andi out for a walk. Andi slowly stood up and appeared to be in a lot of pain. She walked with a definite limp, a clear indication of hip dysplasia which is so common in larger dogs. Andi was an overweight dog and the extra weight was putting a significant strain on her hips. 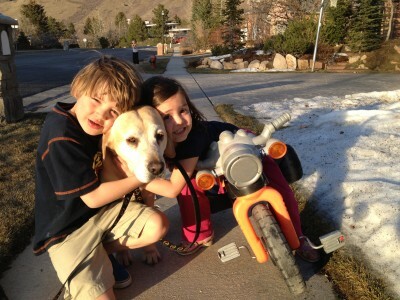 Despite these limitations, our children quickly fell in love with the old yellow lab on the walk. When we brought Andi back to her kennel she dejectedly went back in with no signs of separation anxiety. Our kids begged us to take Andi home but Jane and I needed more time to think about this big commitment. 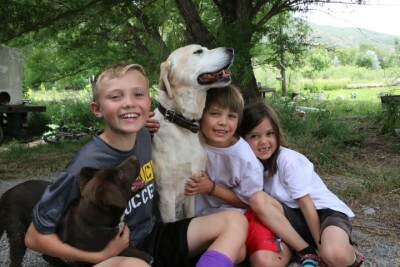 We also wanted to make sure the children were 100% committed to caring for this sweet old dog. For days we debated as a family whether or not we should take the plunge and adopt Andi. Finally, we gave in to the promises of our children that they would indeed care for Andi. When we finally called the Humane Society they told us that Andi had already been put to sleep. Our children were in tears. What should we now do as parents? We obviously waited too long deliberating this decision. We decided to return to the Humane Society to look for a different dog. As soon as we reentered the kennel our children once again spotted the old yellow lab sleeping in the corner kennel. Fortunately, she was still alive and available for adoption. We immediately adopted her. We gave Andi love, put her on a healthy diet, and exercised her daily. Within a couple of months she lost 20 pounds, her arthritis resolved, and she once again became an energetic dog. To this day my wife, Jane, still regularly climbs mountains with Andi. Each day Andi walks with the children to and from the local elementary school. Today, she is 12 years old and remains in the best physical condition of her life. She is growing “younger” year by year. What are the lessons of this story? 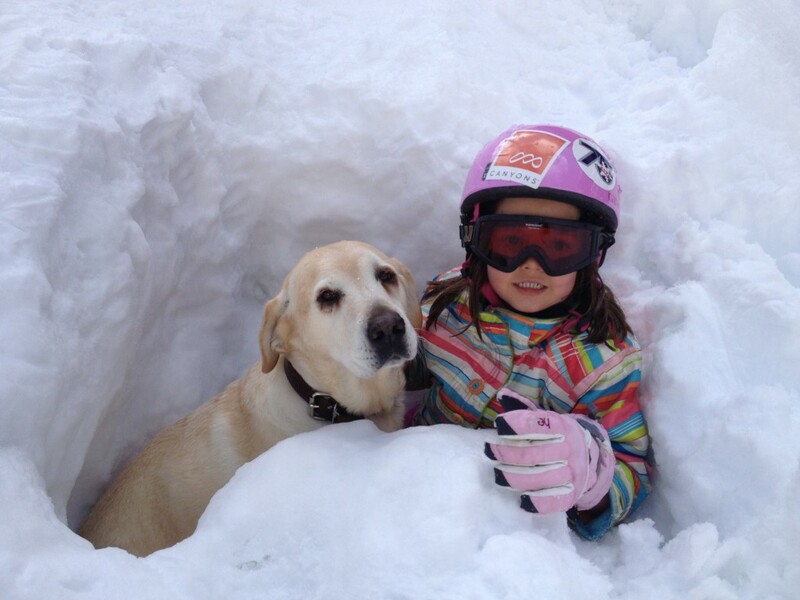 In the right environment this old yellow lab, who was struggling with depression, obesity, and arthritis could be transformed into a much younger dog that was lean, happy, and energetic. Why has Andi been so successful in maintaining her healthy lifestyle when most dogs in the U.S. suffer from obesity and physical inactivity? It all comes down to having the right supportive community. With the right supportive community we too can effortlessly maintain a healthy weight, eat the right foods, and get enough physical activity. The key to health and nutrition is not willpower but rather in creating the right supportive environment. One hundred years ago you would never have seen an obese dog. Now, according to this CNN report, 55% of all dogs in the U.S. are obese. How can our obesity epidemic also strike dogs? It should be so simple to prevent your dog from becoming overweight as the dog’s guardian has 100% control of the dog’s diet. Perhaps this is the challenge. Being overweight is now viewed as the norm for dogs just like in humans. It is not as if our dogs consciously make the decision to eat junk food and gain weight. They are just like us. If you surround them with excess quantities of food or unhealthy food choices they will willingly partake just like us. Dog’s have very limited willpower. For a dog to live a healthy life they are 100% dependent on the right supportive community or home. If they have the right home their diet will be healthy and they will never miss the extra meals and unhealthy food choices. Dogs, like us, were built to move. Unfortunately, most dogs are now also very sedentary. Dogs need a reason to be physically active. If not they tend to sleep most of the day. Dogs will not just spontaneously start running up and down the stairs to exercise in your home if they don’t get enough exercise opportunities outside from their guardians. Like us, they need the right environment to thrive physically. Why do diets and exercise programs fail? I have often pondered why 95% of diets fail and why most people quit their exercise program within 6 months. Is it because we are weak willed? Absolutely not. The reason is that for most people it is extremely hard to swim upstream when everyone else is floating with the downstream current. In other words, if most people are eating the Standard American Diet (SAD) and junk food is everywhere around you then chances are that you will partake. To make a healthy lifestyle “stick,” you must be in an environment where everyone else is living the same way. My Culture Shock in Taiwan at Age 21: No Junk Food! I grew up a junk food junkie. I lived the American lifestyle. I loved my soda pop, pastries, sugar cereals and just about any other simple carb I could find. At the age of 21 I suddenly found myself all alone without access to junk food in Taipei, Taiwan. This was my first trip out of the U.S. I spoke Chinese fluently and was looking to immerse myself in the language and the culture. A Chinese family willingly welcomed me into their home for the summer. I thought I was ready for this experience. The thing I was not ready for was the complete absence of junk food. There was absolutely no junk food in the home of the Chinese family I was living with. In 1988 the Chinese just did not have the junk food habit that we had already developed in the U.S. It was a difficult experience for me. I went through severe sugar withdrawals. I was not prepared for this sudden and unexpected “sugar detox.” I had severe cravings, dizziness, and was irritable for days. I searched Taipei for Western food stores that catered to foreigners to get my sugar fix. I did find these stores but on a student’s budget I could not afford the junk food. I had no choice but to detox. Amazingly, after a couple of weeks I had completely lost my sweet tooth. As no one around me was eating junk food I never missed it at all. There was no “new year’s resolution.” I just lost weight without even trying and it did not take any willpower at all. The old adage, out of sight out of mind was definitely true in my case. It was so easy. There was no willpower required. I thought I was forever cured of my sweet tooth. Perhaps this is how our dog, Andi, feels living in our home. Unfortunately, at the end of the summer I returned back to the U.S. to resume my college studies. Within a week or two of seeing all of my old college friends gorging themselves on junk food the cravings returned. I was hooked again. When we have stayed in China’s Longevity Village over the years, we too, temporarily lost our cravings for junk food. Why is this the case? It is because we didn’t see it anywhere. There was no one to tempt us. When I give lectures and presentations on the amazing health and longevity of the people living in China’s Longevity Village, I am often asked how is it that the Chinese in this village have so much self-control to eat right and stay physically fit. The are so surprised to hear that they do not have any more willpower than we do. They are just like us. In fact, as soon as these rural Chinese migrate to the big cities in China or to the U.S. they soon adopt our Western ways. Indeed, they key to their success is the same as with our dog, Andi. Unless you are part of the 5% of people with superhuman willpower, they key to health, nutrition, and physical activity is the right environment. Willpower is a finite resource. You simply cannot swim upstream when everyone around you is blindly floating downstream for long. Yes, you can muster enough will power to do this for a few months but not for a lifetime. Living like this is also miserable. You may even feel “deprived.” There is an easier way. It is the way of our dog Andi or the residents of China’s Longevity Village. Here are my 8 easy steps to change your environment and change your life. You cannot control the junk food your coworkers bring in to the office or what is served at the church or community social event. However, you do have 100% control over what is brought into your home. Willpower is limited and can be depleted. Make your home a sanctuary from the world. You don’t need to battle food cravings within the walls of your own home. Commit now to never bring junk food into your home again! You need to find someone that will hold you 100% responsible. For many, this could be a personal trainer, exercise partner, or anyone that is not afraid of holding you accountable to your goals. If there is no one in your life that can fulfill this role you could even look to an online app or a virtual group of people all trying to accomplish the same goal. If you have to report back to someone you will not want to let them down. For example, I found that 92% of my overweight patients suffering from a serious cardiac condition were able to maintain an incredibly healthy lifestyle when they were accountable to me by a daily email and a weekly face to face meeting. Can an alcoholic stay sober when they enter a bar? Of course, the answer is “no.” The same is true for us. For me, my “bar” is my hospital’s cafeteria. There, the sirens call of pizza and Diet Coke often seems to deplete my willpower. For me the only thing that seems to help is to never set foot in my hospital’s cafeteria. I have found that when I pack a healthy lunch I never miss the pizza or the Diet Coke at all. My willpower stays strong and I feel much better in the afternoon. What is your “bar?” Identify these danger spots and avoid them. Does the TV contribute to an unhealthy lifestyle for you? Can you replace the sofa in your front room with a treadmill or exercise bike? Perhaps you need to get rid of the TV? Do you have a place to exercise in your home when the weather is not good for exercising outdoors or you don’t have enough time to run to the gym? Make it easy to exercise. 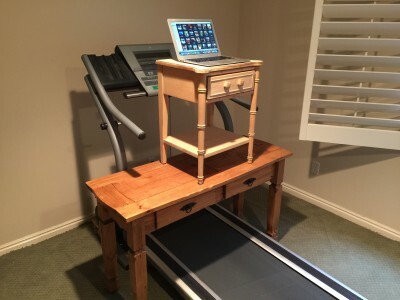 Dedicate a room or corner of your home to exercise when you are in a bind. For me, I need time to write articles like this or the book we are working on with Harper Collins. 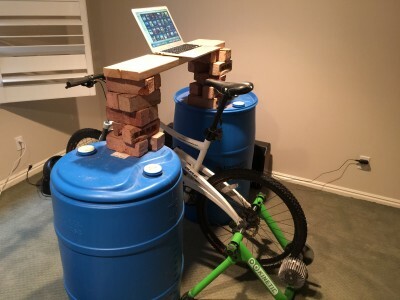 To help me meet all of my needs, I have a treadmill desk as well as a bike desk in an unused room of our basement as seen here. Did your Mom tell you the importance of picking the right friends when you were young? Why is this advice so important? Studies show that you become the person you spend the most time with. It has often been said that you become the sum of the 5 people you spend the most time with. I bet that I can probably predict your healthy just by looking at the 5 people you are closest to. If you spend time with people who eat junk food and sit most of the day you cannot help but to do the same. Studies show that your friends and family members will subconsciously determine how healthy and vibrant you are. Spend time with people that you want to become more like and you will naturally adopt their healthy habits. Become friends with someone healthy today! To succeed with a healthy lifestyle you need to make it the path of least resistance. Always have healthy snacks with you. Put fruits and veggies on the top shelf of your refrigerator where you will see it easily. Have the right cooking tools and ingredients on hand to quickly prepare a healthy meal. Sleep is critical to a healthy lifestyle. Keep your bedroom clutter free. Never bring electronic devices into the bedroom. Keep it simple, clean, cool, and dark at night for sleeping. If you are well rested then it will aid you in your quest for health. Stress is a given in our modern life. Stress is everywhere. The key is to have a plan to manage stress every day. If you don’t manage stress it will manage you. Stress management could take on many different forms. It could be yoga, meditation, a walk in nature, or even spending time with family or friends. Identify what works for you and make it part of your daily stress management plan. At the end of the day, dogs are just like us. They will eat whatever they have access to. Likewise, they’ll go outside and exercise whenever someone takes them out. Do you have the right supportive environment for health? If you have enjoyed this article please share it with a friend! Dr. Day, I have been on a diet of 800 to 1000 calories a day for the past 4 months. I have strawberries, cup Rice Chex, cup 2% milk and 2 tbsps. of sugar for breakfast, I quit drinking coffee. Lunch is a large salad, cucumber, onion and tomato and nonfat dressing and a 1/4 of a skinless chicken breast. And for dinner I have a can of green beans and a ¼ of a skinless chicken breast. I try to drink more than 8 glasses of water per day. I ride my recumbent bicycle every day for at least 30 minutes. So far I have lost 40 pounds but now I am stuck at the same weight and cannot seem to lose any more. What is causing me to stop losing weight even when I go to 800 calories a day? Just some other pertinent information about me. I am 77 years old. I have had 10 back surgeries and one of the surgeries has caused it to be hard to walk. I had my left hip replaced last July. I try to be as a physically active as I be. Is it possible that the Sotalol that I am on for A-Fib is causing me to stop losing weight? Thank you so much for your comments. Congratulations on your 40 pound weight loss! This significant weight loss will definitely help with your A-fib! An 800-1000 calorie diet is something that is extremely difficult to do long-term. I worry that such a low calorie diet has shifted your metabolism to slow gear. Indeed, this may be the case if you are not losing any more weight. I have been meaning to write an article just on how to increase your metabolism. I have touched on this subject from various different angle but have not yet done a comprehensive article on the subject. With all of your back surgeries many forms of exercise may be difficult to do. Perhaps you could consider adding water aerobics or weight training to your recumbent bicycle each day. Increasing your exercise/strength training could help to boost your metabolism. Most recreation centers have trainers that can help you do this safely. Check with your physician first. With regards to the sotalol, or for that manner any beta-blocker, yes these medications can cause weight gain and slow metabolism in some patients. I have had many patients report weight gain with these types of medications. Perhaps you could explore a different medication or treatment option for your A-fib with your physician. As I don’t give any medical advice online, please continue to work with your doctor.